He took them away and nailed them to the cross. Hear audio messages covering the specific issues you are struggling with. Learn salvation deeply and clearly by auditing a seminary course taught by Pastor Fulton (no cost). Enjoy some excellent reading material from great men like Charles Spurgeon, John Bunyan, and others. 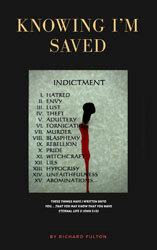 Knowing I’m Saved – The Book.